Rick's Pocono Blog: A Pocono State Park Trail Run! Welcome to the Pocono State Park at Tannersville Pa , in the lovely Pocono Mountains of Pennsylvania to all the outdoor enthusiasts. The first race in the Pocono Xterra Series takes place at Big Pocono State Park. This race will cover three miles of rugged rocky trail with spectacular views. Looking over the top of Big Pocono State Park you can see the Beautiful site of the Ski Trails at Camelback Ski Resort & Water Park. Anyone can enter this race! The cost is 20$ by mail and 25$ on the day of the event. The race will take place on Saturday May 5th, 2012 at 10 AM. Big Pocono State Park is a Wonderful State Park in the Pocono Mountains that offers recreational activities, scenic views, wildlife sitings, and much more! You may see whitetail deer, wild birds, and maybe a bear or two. Get your cameras ready at Big Pocono! The park consists of 1,306 acres of rugged terrain on the summit and slopes of Camelback Mountain. 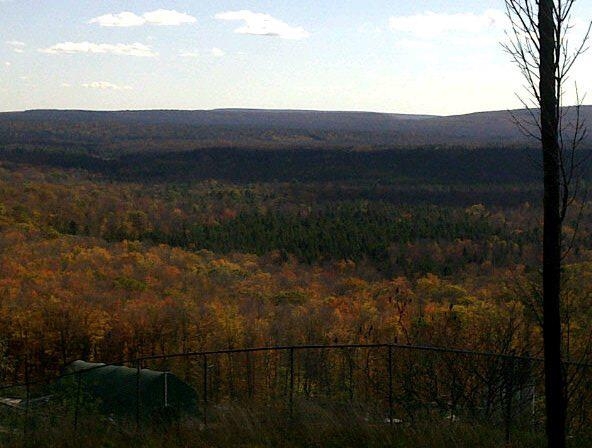 From the summit, all Big Pocono State Park visitors enjoy a spectacular view of a vast portion of the Pennsylvania Pocono Mountains and portions of New York and New Jersey. The park is open from sunrise to sunset. Catch a sunset over the Beautiful Wilderness of the Pocono Mountains. There are 3 picnic areas with plenty of tables and grills for a great Pocono Cookout. About 800 acres are open for hunting. Unless hunting is in season, hunters are required to keep firearms in their vehicles for the safety of the park visitors. There is even a chance to dine out in the wild at Cameltop Restaurant. Operated by Camelback Ski Area, the restaurant may be reached by the park road or by ascending the mountain on the ski area chair lift and is open daily to Memorial day to Columbus Day. Horseback riding, Mountain Biking, and Hiking are all Recreational Features of the Big Pocono State Park! Who's joining in the race at the tippy top of the Poconos? !